As some of you know, Team Salvato most of the time contains no more than one employee, and so the responsibility for things like fan engagement, new content, merchandise, and a lot of the business-related affairs have most often fallen on my shoulders. Given the unexpected explosive growth of DDLC in the months following release, it was a role I was not fully prepared to take on. The sudden stress resulted in a pretty sharp decline in my mental health this year. Thankfully, I’ve lately been feeling like I’m back on my feet, and things have started to kind of move forward again. But if it seems like a lot of things have just taken a long time this year, it’s mostly because of the difficulties I’ve had in adjusting to my new roles. 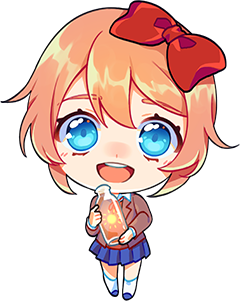 I’m very thankful that DDLC has such wonderful fans who continue to find more ways to enjoy the game, characters, and franchise. But I also have an incredibly strong desire not to let people down, and I’m also not the person to give up on my projects. So even if it takes me a long time, I’ll always be coming out with cool new stuff for people to enjoy. I’ll be talking about my upcoming work as I feel like they are ready to talk about. But it will just take a long time to get there. Over the past few months, we’ve been working on some awesome merchandise projects and collaborations with partners we love. DDLC Store – Our online store has gotten an overhaul after finding some great partners to help us run it. Alongside our usual offerings, we’re now selling plushes, and we have t-shirts on the way too. iam8bit – We’re working on a vinyl soundtrack for DDLC with art by OMOCAT. We’re very excited for introducing this collector’s item as we’ve gotten a number of requests for it and think it’s a great art form. For Fans By Fans – The DDLC Fan Forge is in full swing, with a range of products including t-shirts, posters, wallets, bags, and more. All the designs were created by DDLC fans who receive a share of the revenue for their designs. There’s still a lot I would like to get done with DDLC, such as translations, porting to other platforms, and some other fun ideas I’d like to explore. I’m currently making the preparations necessary for these things to actually start happening, but I’m not ready to announce any kind of timeframe yet. Aside from the existing DDLC game, I would love to find other fun things to do with the DDLC universe, because I know how much it means to fans, and I also see some opportunity there. So, I’m playing with some ideas and hope that something will come of it someday. I’m not trying to be deliberately vague in any way, it’s just an honest evaluation of where things are right now, and what I’m hoping to do in the future. Again, it’s something where I’ll talk about things as I feel like they’re ready to talk about. I frequently have people ask me when they can expect information on future Team Salvato games. While I believe the rest of this post more or less covers what I have going on, I also feel that I should explicitly state that I won’t be announcing or releasing any new games in 2018. My timeline looked very different a year ago, with me thinking that after releasing DDLC I could put 100% of my focus into my next game. But so much has changed since then, with the result being that things are just taking longer than expected. But in the end, it will be for the better, as I think I will now be able to make new games that are of higher quality than what I envisioned a year ago. I’m very eager to continue working hard on future projects that I can someday share with all of you, giving you more great experiences. Thank you for taking the time to read this update and for believing in us!